One of the biggest problems I find when packing lunches, is how to avoid the usual sandwich-crisps-cookie cycle. Breadsticks are great, because they count as one of their starchy foods (so fill up their little tummies), they help break that s-c-c cycle, but you can incorporate many other ingredients into them or create (or buy) easy dips that they can… well, dip the breaksticks into. It just makes their lunchboxes a bit more interesting without too much bother. 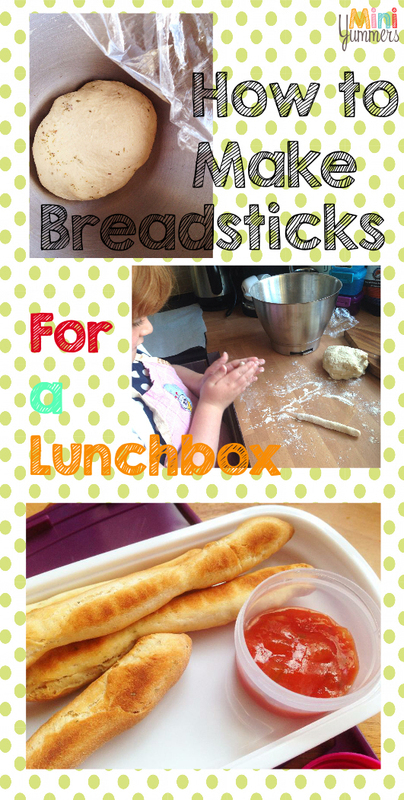 Not only do breadsticks solve a lunchbox problem they also last for ages and are a perfect little snack for after school too–you get a savoury hit in only a few calories. I don’t blame you. There are many days where I can’t be bothered either, but I promise that breadsticks are easy to make and they are much more yummy than the ones you buy. In fact, we are going to make pizza breadsticks (without the cheese), so they are definitely more yummy. The good news is that not only do breadsticks have a long shelf life, you can also freeze them. So it make take a small amount of effort now, but then you can easily pull a few out of the freezer in a few weeks to fill up that lunchbox at the end of a day when you have a headache and just want to get to bed. 1. 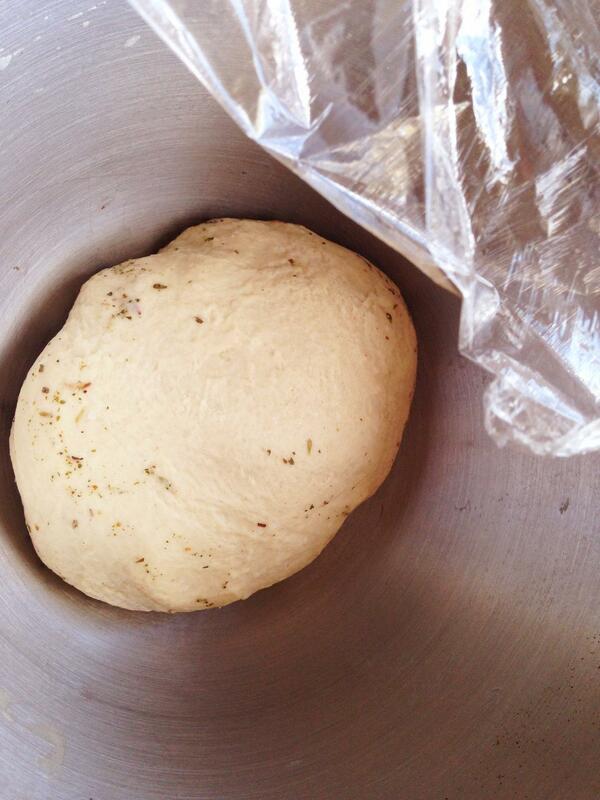 Mix the flour, salt, sugar, yeast, and herbs together. 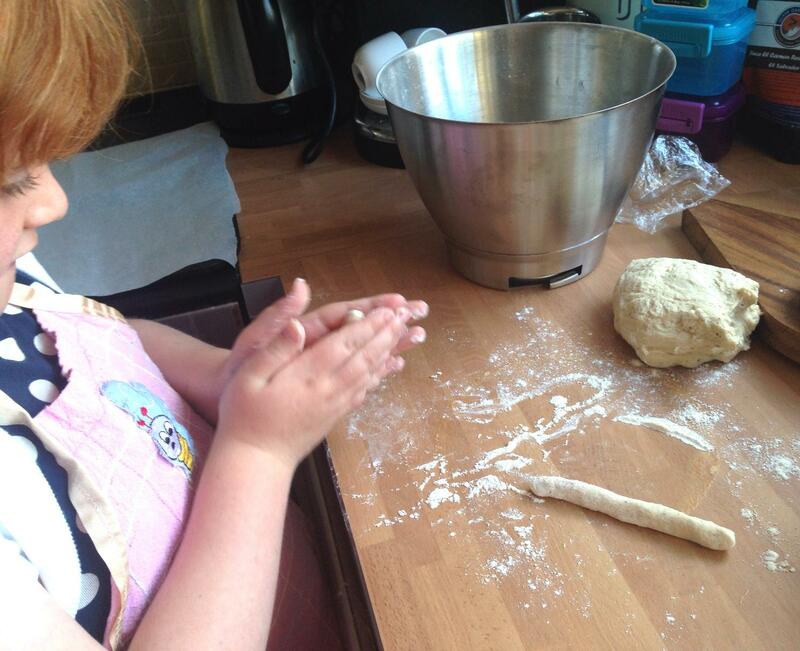 Add 120ml (1/2 cup) water and use a wooden spoon, to start with, to work it into a dough. 2. Once the dough is less messy you can get your hands in the bowl and knead the dough for about 10 minutes until it’s nice and soft. Cover the bowl with cling film for 1 hour. 3. Grease or line with baking parchment, at least 2 baking trays. Preheat the oven to 220c (425f, gas 7). 4. Give the dough a quick knead and start to break off pieces, about the size of a walnut. Roll each piece into a stick about the thickness of a pencil. 5. Place them on the baking trays with a slight gap between each–they swell a little when cooking but not too much. 6. Once you’ve done them all, put them in the oven and check them after 12 minutes. If they don’t look quite done then you can give them another 3 minutes. They should be cooked and dried out all the way through. You can store these in a food/freezer bag or a container and they’ll keep for over 2 weeks without going yucky. Or you can freeze them and just take a few out as you need them. After going to the effort of making yummy breadsticks it would be unrealistic of me to assume you’ll now go and make a whole load of your own homemade dips. I certainly don’t, but here are some options that you can buy from the store, put in a little salad dressing container (as pictured), and your little guys can dip away come lunchtime. These dips also allow you to sneak in some extra dairy, veg, or fruit into your kiddos lunchbox. Any other suggestions? Please let us know.